Email is of course a standard feature for smartphones and tablets. But if you want to be truly effective in reaching your readers and customers, push notifications are the way to go. Emails pile up. They get clogged in spam filters. They’re easy to lose track of in the deep dark depths of your inbox. And email just isn’t the best choice for getting time-sensitive material out into the wild. You could send out an email that contains information about a one day sale that doesn’t get read until it’s too late for the customer to take action. Push notifications give you the power to immediately alert your readers. And because push notifications show up on the screens for people’s mobile devices, the information you want them to have is instantly received. 90% of SMS messages are read within 3 minutes of being delivered, and push notifications show up in the same way. If you’re a business such a restaurant, you can let people know about those great new lunch specials from 12-3. For a school, you can alert parents to pertinent information such as a last-minute schedule change for sports practice or even a snow day. Maybe you have a food truck and you want to let people know where you’ll be setting up shop for the evening. And of course, if you’re a blogger, you can notify fans that a new post is live. 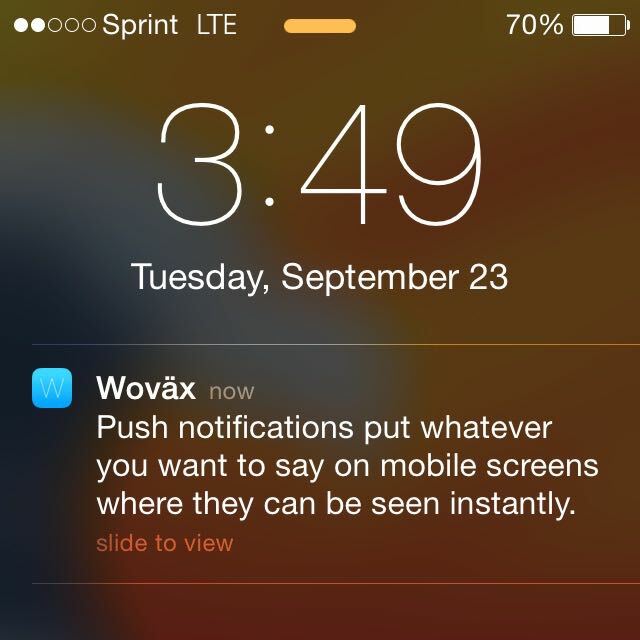 At Wovax our apps are built to work seamlessly with WordPress push notifications. So whatever your business may be, you can be sure that people will stay informed of it. And they’ll choose to do it in the most efficient way possible – through push notifications.